I went to another good museum – the Highland Folk Museum at Newtonmore. It is, according to the curator at Laidhay Croft, a ‘living museum’ so called because it has things going on, not just to look at. (different health and safety regs, different insurance policy, from what I gather). 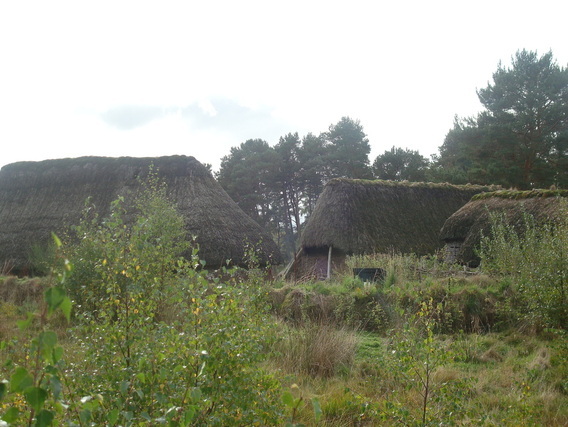 They have recreated a 1700s township, with replica buildings based on actual remains found elsewhere – crick framed, turf walled dwellings with peat fires, thatched with heather, bracken and broom. What interested me about their construction was how little wall there was. There is a low dry stone wall type layer – a thick wall two or three feet high – to serve as foundations – and possibly a damp-course. On top of this turfs are laid – heather turf, cut after the heather has been cut (or burnt possibly). They are sturdier than turf rom the lawn, with a knotted, woody root structure. Above this is pretty much just roof. This seems to have a number of benefits. Firstly protection from the elements – snow drops straight off a steep roof. It is also easier to reach, and you don’t have to worry about the stability of the structure. The weight of the roof is taken by the cruck fram design (they’ve got a build one yourself’ cruck frame kit at the museum, for kids to have a go). So the walls, a few feet high is unlikely to fall over, even if you’re not much of a builder. I can sort of imagine building one myself. But the best thing about it is from the inside. All the way around the house you’ve got this handy shelf come bench come alcove. 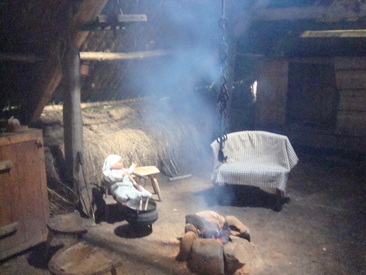 In this image, if you can see through the peat smoke (the museum had proper fires burning, although they don’t light them with flint and steel), you’ll see that at the back the roof comes down to a white splodge. Well, that’s sheepskins or a woven blanket draped over the turf wall. Very comfy to sit on very handy to put stuff down on – like your knitting or your baby or whatever. I’ve got more examples of turf wall construction, but I’m in the visitor centre cafe at Glencoe – the internet is very slow and the weather is very lovely, so I’m off to the mountains.